This doesn’t actually have anything to do with the Joyce Carol Oates story of the same name. I just love that title. I also love the story and recommend it to anyone else who is likewise fascinated with American fables. 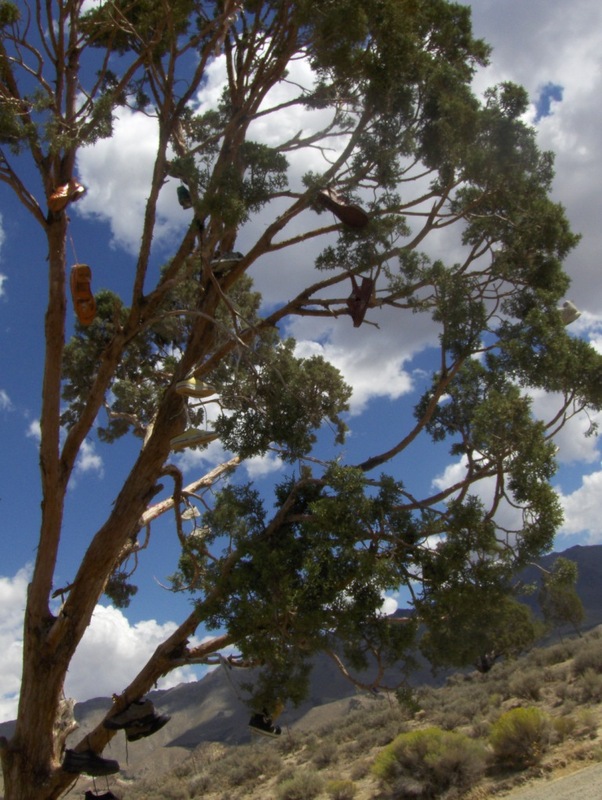 The shoe tree on the drive from Seattle to Reno. It’s my most dreaded of questions that new acquaintances ask me. It is also one of the most common in a city of immigrants and transplants. I’ve always struggled with how to answer. Buffalo? Reno? Seattle? My answer is Seattle, because if I have to launch into a discussion about one of those cities, Seattle is the place I want to talk about. Plus I lived there for five years. But I’m also coming up on my five-year anniversary of living in New York. Five years. I can’t believe it. Instead of wearing it like a New Yorker badge of honor like a lot of people do, I find myself wondering, “How did that happen?”I can demarcate my time in this city by the different periods where I was sure I was going to leave, where I hatched a plan and set a secret date for my Exodus. But here I am. I think of the day I left Seattle. I crashed at my friend Eric’s apartment, because I had sold him all my furniture and had no where to sleep. He drove me back to my apartment on a foggy morning. He called it “Chrissy weather,” that perfect mixture of summer fog that dissipates by mid-afternoon. I packed up the last of the things into my Jeep and headed to the coffeeshop where I had worked for three years. My boss Anna gave me treats for the road and everyone hugged me. It was a Sunday, and I set my radio to listen to the Mariner game. I drove South on I-5, passing the stadium. The farther South I got, the less I could get the game on the radio. I wiped a couple of tears from my eyes and ignored the voice screaming inside of me that told me not to leave. Six years later, I can’t believe where I am and what I’ve been through. I never thought Reno would lead to New York. I never thought I’d get to go to Japan and Iceland. I never thought I’d become a veterinary technician. I’m a happier person now than I was when I left Seattle, but it’s a strange thing to mark the passage of time. What would life have been like if I had turned the Jeep around and driven back into Seattle? It’s foolish to think about, because I will never know. It’s a bittersweet feeling to realize that soon I will have lived in New York longer than I lived in Seattle. What does that mean exactly? Am I from here now? Can I no longer claim Seattle a home? Why doesn’t that make me happy? Most importantly, what do I do next? Where do I go? I am first and foremost, a baseball fan. I’ve spent seven baseball seasons, hopelessly devoted to the Seattle Mariners. I spend six months out of the year checking on baseball blogs, watching games, tracking team standings. But it leaves the other six months of the year lacking. I have been trying to get into football the last couple of years, but it hasn’t happened for me. This year things have changed. I watched a couple of playoff games last year and saw that the Seattle Seahawks were becoming a viable team. Before this season started, I started dating a dashing young man who knows oodles about sports. We spend our Sundays watching football, him explaining a lot of the little nuances of the game to me. I read articles here and there about the team. And I’m enjoying it so much! The Seahawks are amazing this year. Russel Wilson is incredible. Our defense is unstoppable. Marshawn Lynch seems to fly through the air over the other team’s defensive line. It is the first time in my 27 years that I have had the pleasure of supporting a successful team. Yesterday, that dashing young man took me to the Seahawks/Giants game at MetLife Stadium. 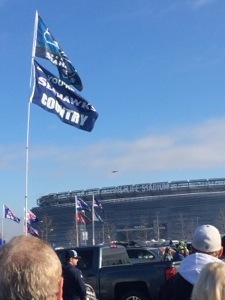 Decked out in our Russel Wilson jerseys, we tailgated in lot J8 under a flag that deemed that area Seahawks country. We were surrounded my hundreds of other fans in Jerseys, hats, scarves, tutus, chanting “Go Hawks!”, taking Seahawks-colored Jello shots. While waiting in line for the Porta-Potty, the man standing behind me asked if I was from Seattle. I told him I was. “But you live in New York, and still follow the Seahawks?” he asked. “She’s more of a Seattle fan,” my boyfriend said, defending me. But I had nothing to say back. I’ve been called a bandwagon fan before, but I have always laughed it off as ridiculous. I’ve been following the Mariners through six painful, losing seasons after all. But this man had a point. I only became a Seahawks fan during their winning season. Was I bandwagon? I brooded on this. And it comes down to what makes up fan loyalty? The Mariners I fell in love with in 2007 are not the same team they are now. Felix Hernandez is about all that’s left from back then, and it’s only six years ago. It has a lot to do with the city. I dream of Seattle and feel pride of anything good that comes from there. But being a fan is a unique kind of loyalty. For one reason or another, a fan picks a team and sticks with them. They believe in them, follow them. Every fan has a unique story as to why that team is theirs. I hate when Bandwagon is a term that fans throw around in exasperation. It reminds me of a child on a playground retorting, “Oh yeah, well your stupid!” It’s the easy thing to say. Your a fan of a team that’s better than mine? Well, then you must be bandwagon. To me bandwagon is a fan who lacks that loyalty, who doesn’t dedicate themself to a team, who chooses their team superficially due to popularity or style. I met a Yankee fan at a Seattle Mariner’s game who asked me if Joe DiMaggio was on the team or not. THAT’S bandwagon. I have dedicated my loyalty to an amazing team, from the greatest city in this country. The fact that they happen to be on their way to a Super Bowl championship, well, that’s just icing on the cake. It’s only today that I found out that Raul Ibanez signed a one-year contract with the Mariners. I agree that it’s a strange way to spend $2.75 million in the offseason, on a 40-year-player… with sad home/road splits…and limited defensive offerings. But let’s not focus on the negative. I’m excited! I have a soft-spot for Raul, because I believe he is semi-responsible for me getting a job with the Mariners. In July 2007, I had just returned from a whirlwind trip across Europe. It completely changed my outlook on life, and it also left me completely broke. Back in Seattle, I was hard at work as a barista, but those meager latte tips were not cutting it. I searched CraigsList and found out that the Seattle Mariners were hiring part-time employees to sell game-day merchandise. I had been to one game back in my freshmen year of college and loved it, so I thought I had nothing to lose and applied. I got the interview and headed down to SafeCo Field. I walked around the stadium trying to find the entrance that would lead me to the front office. I looked at the large banners hanging by the home plate entrance. There was the recognizable Ichiro and a bunch of other dudes I had never heard of. One of which was Ibanez. I liked the name, and as happens with words/names I like, I started repeating it to myself in a variety of tones and accents. In the interview, I was asked if I was a Mariner fan. “Oh yeah, huge Mariner fan here.” I told him, lying completely. I paused to think this one through. I didn’t want to say Ichiro, because that was the obvious choice. So I blurted out that odd name that had been stuck in my head. I might have even mispronounced it. So I got the job and consequently fell in love with baseball and the Mariners. All because of Raul. I remember working Sunday day games and seeing him and his sons play catch in the outfield before the gates opened. I remember watching him getting home runs this last play-off season and feeling like he was still my guy. Man, I can’t wait for baseball season to start again. Less then 100 days! This year I have little hope that the Mariners will make playoffs of any kind. But I still feel like I’ve got to get back to Seattle. I’ve got to get back to SafeCo field. And I must cheer Raul’s name when they play “Werewolves in London” for him.